Get time-saving teaching tips, effective strategies, and awesome freebies right to your inbox! 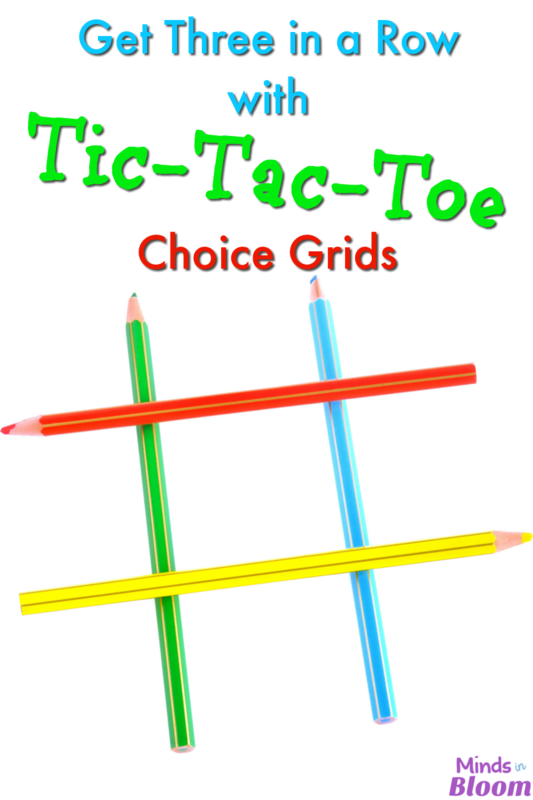 Get Three in a Row with Tic-Tac-Toe Choice Grids! One of my mentors from my early teaching days said that we should strive to give students “freedom within structure.” Tic-Tac-Toe Choice Grids are one excellent way to do that. To make a Tic-Tac-Toe Choice Grid, simply put nine more or less equal projects, assignments, or activities into a 3×3 grid. Students must then choose three of the projects to complete. However, just like in the game, the three choices must all be in a row. This forces students to make choices, weighing one option against another. A student may have to complete a project a little outside his comfort zone in order to get the one he really wants. However, it is likely that he will be more open to the more challenging assignment if he chooses it, rather than having it forced upon him. Tic-Tac-Toe Choice Grids can be used in a variety of ways. Certainly, they could be integrated to most science or social study units. Journal prompts are another excellent application. Since students must choose three, you can distribute a new set of prompts at the start of each week. Then students choose three to write about on Monday, Wednesday, and Friday. If you journal for five days each week, Tuesday and Thursday can be free choice days. Another possibility is to use them in your spelling program. Students choose three spelling activities to do during the week before the test. This will work great for individualized spelling programs or if you generate your own lists. It saves on copying, as well, since students complete their work on notebook paper rather than on worksheets. Because there are nine choices, you could use the same grid several times during the year. You could also use Tic-Tac-Toe Choice Grids with your literature program. Students could choose three to complete during or after reading. Again, great individualization – it can be used with a class book or when everyone is reading different books. A final added advantage to Tic-Tac-Toe Choice grids is that it makes grading all those activities more interesting for you. Instead of 24 versions of the same activity, you get a little variety. Want more? Sign up for time-saving teaching tips, effective strategies, and awesome freebies right to your inbox! Look for a freebie in your very first email! Time-saving teaching tips, effective strategies, and freebies right to your inbox! Stay updated with all latest updates & much more.